In a random, middle of nowhere location, and a small discrete door, you would never think that it would be a 2 hour wait for a table! It's defined as a hipster spot, but I think that the Mission is more hipster than this place. The spacious inside isn't the only misleading this when stepping up to the doorway, its the sweet outside bar area. If you opt not to wait, you can get mini pizzas made with day old dough outside, as well as some bar snacks. At two hours, I sort of expected more from this place. The pizza is very chewy and doughy so great if that's your thing, but I like my pizza crust with a little crunch. This one had none at all. It did have nice charred marks on the dough, but the smokey flavor didn't transfer onto the slices. Fresh basil, tomato sauce, and fresh mozzarella topped the pizza, but they didn't stand out. 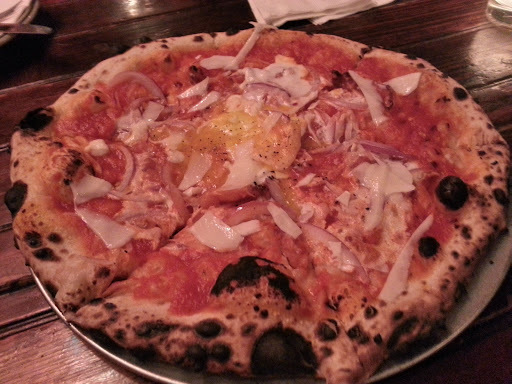 I attempted to make my own Purgatorio (from Pizzeria Delfina) using Roberta's Amatriciana and then adding an egg. With the tomato, pecorino, guanciale, onion, and chili plus runny egg, I was hoping for something gooey with a little kick. Purgatorio has easily become my favorite at Pizzeria Delfina, but this New York substitution didn't come close. The egg was barely runny and each slice tasted like only of onions. Interesting take. I ate there this past March and had the Bee Sting. It was tomatoe, mozzarella, sopresata, chili and honey. I understand the hyperbole I'm about to use; it was the best pizza I've ever had. 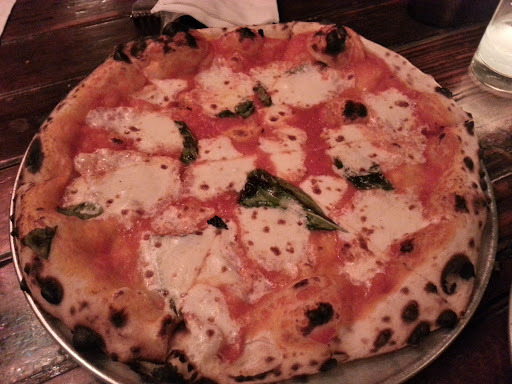 Tony's in North Beach here in SF have a similar one (Honey Pie), but the Bee Sting at Roberta's was unreal. 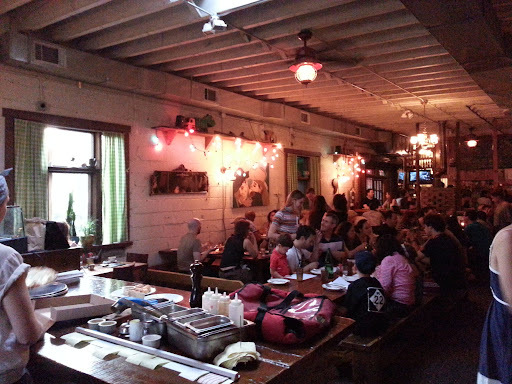 Oh, I'm sad I missed out on the Bee Sting at Roberta's. I'll have to check it out another time I'm in the area. I've been to Tony's and never had the Honey Pie. I'll have to make sure to stop by for a bite. Thanks for reading!